Palmer never grew out of that curiosity about how things work -- or how they could be improved. So one night off the Florida coast in 2001, as the commercial fisherman patiently waited for swordfish to bite, he started thinking. "I remember wishing I could have another set of lines out there," he told me recently. "I don't know if it was an epiphany, but I just got an idea." 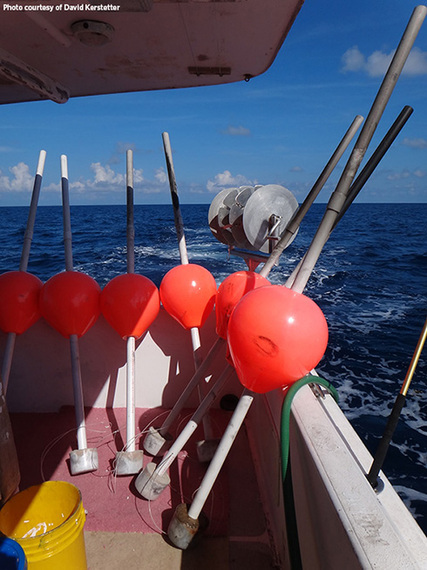 The idea led to the creation of "buoy gear" -- a new type of fishing gear that can more selectively catch fish while also reducing unnecessary deaths of other marine life, such as turtles or sharks, that can be snared by accident. Buoy gear uses shorter fishing lines and fewer hooks than traditional longline fishing gear used to target swordfish. Palmer's creation shows how ingenuity can help solve a pressing problem for marine life. Each year, some kinds of traditional fishing gear incidentally kill large numbers of marine animals, a problem known as bycatch. But in certain cases, changing the types of lines, nets, hooks, or other options can reduce the problem. Palmer and I agree that under the right circumstances, alternative gear such as his can make sense both for the environment and some fishermen. Although Palmer, 44, acknowledges that his buoy gear won't work for everyone, he believes it has a place in the overall pursuit of more sustainable fishing practices. I think he's right, which is why we both would like to see federal fishery managers put more emphasis on working with fishermen to reduce high levels of incidental catch and get more data about overall fish catch. After Palmer spent some time testing his creation in the early 2000s, he got the attention of the National Oceanic and Atmospheric Administration's Fisheries Service, the agency responsible for the stewardship of marine resources, which has encouraged the use of buoy gear. 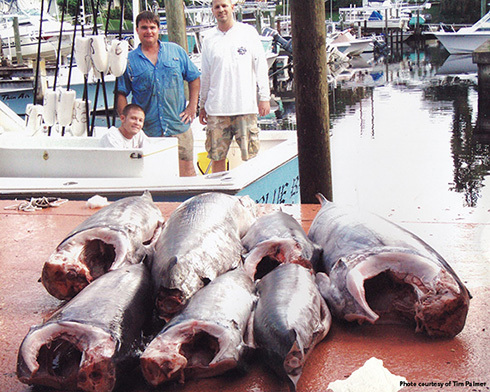 Palmer estimates that about 30 commercial fishermen off the Florida Straits now use it. And Palmer has traveled to Turkey and Morocco to persuade fishermen there of its value. His efforts, both internationally and in the U.S., have not always met with success because, he said, some fishermen prefer to fish as they always have. The gear is "still in its infancy," said Palmer, adding that fishermen who have tried the buoy gear have had mixed results. "But it's giving people food for thought." One place where Palmer believes that buoy gear may have some success is California, where a modified version is being tested. There, fishermen use drifting gillnets that are a mile long and drop 200 feet deep to entangle swordfish -- but the nets also end up snaring and killing whales, turtles, sharks, dolphins, and other fish. Fishermen who have had success with buoy gear are able to haul fish in quickly and catch them closer to shore, so swordfish caught on buoy gear are brought to port faster. Ideally, that means they are fresher and can command a higher price. Fishermen also can save money because they can fish overnight rather than spending days or weeks at sea setting and retrieving surface longlines. Palmer said that he's used a combination of buoy gear and longlines but that he is careful to save wildlife caught on the hooks. For Palmer -- who lives in southeastern Florida, where he grows corals, has six aquariums, five dogs, four birds, and two 300-pound Galapagos tortoises -- his creation was a way for him to help the ocean and wildlife to which he feels connected. Growing up fishing and living near the water, the fifth-generation Floridian believes he has seen the intimate changes from warming seas and overfishing that perhaps the general public doesn't notice. And it worries him. after a night on the water in South Florida. "We're living in the time of the greatest changes in history with our population explosion. One of the worst aspects is I'm seeing so many people vying for a dwindling resource. I see fish stocks basically dwindling. I don't see how the environment can support the human population," he said. Palmer says he is as concerned for the future of his fellow fishermen as he is for the environment. Some days Palmer is discouraged by changes in the industry and isn't sure how long he'll stay in the commercial fishing business. "I know what a delicate balance we have," Palmer said.